Tomatoes are fantastic at this time of year. I bought a large bag for only R5 at the side of the road in Lansdowne. It provided instant inspiration for some delicious summer eating. It’s dead easy but the secret is really ripe tomatoes and quality table olive oil. I used olive oil from Southern Right. Cut tomatoes into about 8 neat segments, as if segmenting an orange into wedges. Grind black pepper over. 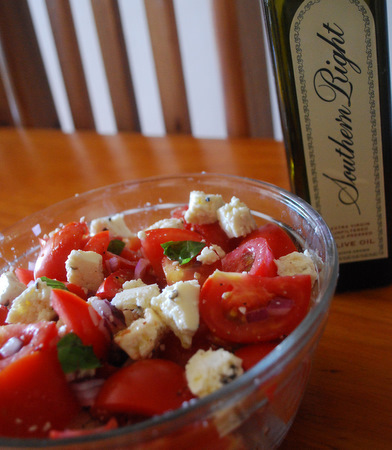 If using feta, avoid adding extra salt as it will be salty enough. Tear pieces of basil, add the fine onion and pour over quality olive oil. Mix through gently with fingers to spread the oil and tomato juices around. Serve with crusty bread and a glass of Sauvignon Blanc.